My interpretation of Linear A fragment PH 8 (Phaistos), largely indecipherable for scanty text, is very much at odds with that of Prof. John G. Younger. This is not the first time either. This Linear A fragment from Phaistos, which was found in the same cache as PH 7, is remarkable insofar as we find on it the sole occurrence of the ideogram for “fish” on any Linear A tablet anywhere, regardless of provenance. is so striking that one is left wondering how this can possibly be. However, there may be less of a mystery here than we might otherwise imagine. It is a well known historical phenomenon in ancient religions that a later religion frequently borrows its iconography from a former. It is true that later religions borrow from older religions, but it seems that these symbols kind of run in parallel to Judaism, as far as I know. In any case, the symbols you are mentioning are linked to the worship of Atargatis. This deity used to be the wife of God in the very primitive versions of Judaism. If what you are pointing is true, it seems that the worship of Mary is justified, since she would be the wife of God. But, as far as I know, this cult among Jews did not exist in the 1st century CE. The Linear A word keta/kete, which very much appears to be the same word, first in the accusative of aspect (keta) and secondly in the instrumental sing. (kete, meaning “with fish”), of which the masculilne singular in Linear A would have been keto, and which is the equivalent of ancient Greek gados. If this is the case, then the fish ideogram on this fragment from Phaistos echoes even more closely the text of Phaistos PH 7, which as we have already seen is a religious ceremony involving a libation of water along with the bread of healing. If all of this rings true, then the relationship between these two fragments is so striking it simply cannot be ignored. Moreover, the Hebrew, manna (grains, bread), interpreted in Christianity as the bread of Heaven, also appears in Linear A as mana, another astonishing co-incidence. Above is the first of 6 extremely rare Linear A fragments from Phaistos: 12a 12b 12 c. The text is extremely difficult to interpret, but I have done my level best. 12a is pretty much indecipherable. 12b consists of fractions. 12c  consists of the single syllabogram TE, which might possibly be the supersyllabogram TE, which usually stands for tereza, a large standard unit of liquid measurement. It would mesh well enough with 12b, since that fragment is all fractions. But there is no way we can confirm this at all, since 12c is a fragment, doubtless with almost all of its original text absent. So without context, we cannot be sure of anything. For the past 65 years since Michael Ventris first deciphered Linear B, one phenomenon has eluded historical linguists and philologists. This is the supersyllabogram, which is always a single syllabogram, being the first syllabogram, i.e. the first syllable of a particular Mycenaean word in any one or more of the major economic sectors of the Mycenaean economy: agriculture, military, textiles and the vessels and pottery sector, along with a few religious supersyllabograms. Supersyllabograms are always independent; they always stand alone on extant Linear. My discovery, isolation and classification of supersyllabograms represents the final frontier in the decipherment of Mycenaean Linear B. Some 800 tablets from Knossos alone contain primarily supersyllabograms, with a subset of these incised with supersyllabograms and nothing else. It is difficult to decipher the former, and impossible to decipher the latter without fully accounting for the presence of supersyllabograms. The decipherment of supersyllabograms accounts for the last and most difficult remaining 10 % of Mycenaean Linear B to be deciphered. This article is 35 pages long (pp. 73-108) in a 29 cm. x 22 cm. format, which is far oversized compared with the standard north American format for research journals (ca. 20 cm. vertical), meaning that if it had been published in the standard north American format, it would have run to some 50 pp., which is the size of a small book. The Editorial Board consists of 21 peer reviewers, all of them matriculated professors and researchers at the Ph.D. level or higher, from Ancona, Belgrade, Belgium, Bologna, Madison, Wisconsin, U.S.A., Moscow, Münich, Philadelphia, U.S.A., Rome, Warsaw & Trieste. Every author must pass muster with the majority of these peer reviewers if his or her article is to be published in Archaeology and Science. That is one tall hurdle to overcome. Is the Minoan Linear A labrys inscribed with I-DA-MA-TE in Minoan or in proto-Greek? PART B: OR is it in proto-Greek? “What?” I hear you asking, “... is that even even remotely possible?” The keyword here is remotely. Remotely, yes, but only remotely. Recall that in the last post, in which I postulated that the four consecutive supersyllabograms ID + DA + MA + TE might conceivably stand for the first syllabogram, i.e. the first syllable of 4 consecutive Minoan Linear A words, though which ones among God knows how many possibilities it is exceedingly difficult to determine. On the other hand, the four consecutive supersyllabograms ID + DA + MA + TE might conceivably stand for the first syllabogram, i.e. the first syllable of 4 consecutive proto-greek Greek words, most likely proto-Mycenaean. If that is the case — and, mark  my words, it is far more likely than not that it is not the case — we are once again confronted with a myriad of combinations and permutations of proto-Greek words which have the potential, however thin, of standing in for the 4 consecutive supersyllabograms I + DA + MA +TE. So be forewarned. The putative decipherment of these 4 supersyllabograms into the one possible decipherment I have arbitrarily posited among hundreds is just  that, putative and tentative, and nothing more. The priestess of Damater... (is making offerings -or- sacrificing to) Mater  Thea (i.e. the Divine Mother) (in) the temple. In this partial sentence, the phrase  (is making offerings -or- sacrificing to) and the preposition eni = “in” do not appear in the original supposed proto-Greek text, which I have extrapolated forward to Mycenaean Greek to make it fully accessible. Although these words are in fact absent from the original putative proto-Greek, they be supplied  with relative ease to fill in the gaps. 1. If as I have pointed out in the previous post, Idamate is an actual Minoan word, as well as being in addition a series of 4 supersyllabograms. Thus, in the Minoan language it may very well mean something along the lines of Damate in Mycenaean Linear B: in other words, Idamate in the Minoan language may be the approximate equivalent of Damate in Mycenaean Linear B and of Demeter in ancient Greek. And if that is the case, the second supersyllabogram (DA) in my parallel proto-Greek translation, which I have deciphered as Damate, almost perfectly matches the Minoan word. This co-incidence, if co-incidence it is, is far too great to be ignored, and it lends a great deal of credence to my proto-Greek translation extrapolated forward to Mycenaean Greek of the second supersyllabogram DA in idamate. And if there was, it was of course a temple. Referencing our proto-Greek translation of Idamate, we find that the last supersyllabogram, TE, may readily and realistically rendered as temeno, which in Mycenaean Greek means “a temple”. How fascinating! But we must be extremely skeptical of such an interpretation. Why so? Just as Pavel Serafimov and Anton Perdith erroneously read proto-Slavic into Minoan Linear A tablet HT 31 (Haghia Triada), thereby grossly misinterpreting it, my own attempt to superimpose proto-Greek on the 4 supersyllabograms I + DA + MA +TE may amount to the same genre of fundamental (and gross) inaccuracy in the putative decipherment into proto-Greek of a Minoan Linear A text, in this case, of the word idamate inscribed on the labrys. So we must exercise extreme caution in hypothesizing that the 4 supersyllabograms  I + DA + MA +TE are the first syllabograms, i.e. the first syllables of the 4 consecutive proto-Greek words I have arbitrarily assigned to them. So the fact remains that these 4 supersyllabograms are far more likely to be the first syllabogram, i.e. the first syllable of 4 consecutive Minoan words than of proto-Greek words. I cannot stress this enough. Since this is a Boolean AND search, if we omit sites dealing with only Minoan Linear A or only Mycenaean Linear B, which do not fulfill this requirement, our site ranks fourth. But since the site, Linear A and Linear B script: Britannica.com is a minor site, we actually rank third. Also, our PINTEREST board is ranked fifth (actually fourth). We have over 1.7 K Minoan Linear A & Mycenaean Linear B translations, photos, maps & images on our PINTEREST board, Minoan Linear A & Mycenaean Linear B, Progressive Grammar and Vocabulary. Click the banner to visit and join if you like! Rita made a couple of small errors in her translations, which I have corrected on the tablets as illustrated above. Her first error was to have omitted the ideogram for “rams” on the first line of Linear B tablet KN 1069 F b09. Although the ideogram is partially effaced, it is clearly that for “rams”, because we can still see the two parallel bars. In addition, the number of rams given in the effaced part of the tablet is lost. Since we shall never know what their number was, I have replaced it by a question mark (?) on the tablet above. On the same tablet, she refers to “units” of wool, which are generally referred to as “bales”. On Linear B tablet KN 1084 E e 321, for some strange reason, she omitted “at Phaistos” on the second line. Nevertheless, her initiation into Linear B tablets in the agricultural sector of the Minoan/Mycenaean may be considered a success. We look forward with anticipation to her future translations. Although I cannot possibly post all of them, as they run into the hundreds, I shall be posting some of the most intriguing in the near future and beyond. 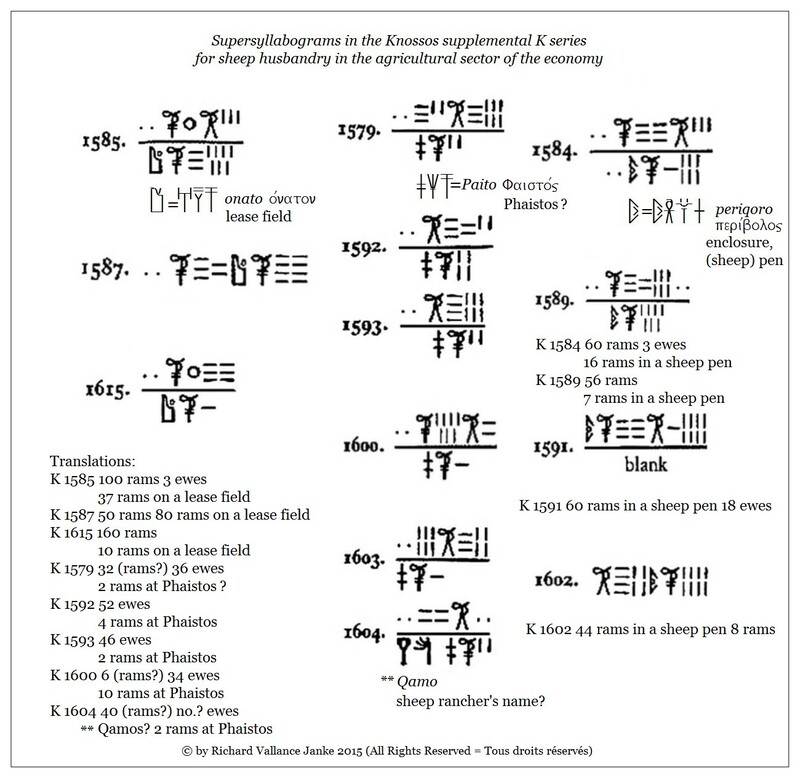 The two supersyllabograms KI = kitimena kotona & O = onaton in Linear B are very frequently concatenated on Linear B tablets in the agricultural sector of the Minoan/Mycenaean economy. This combination of supersyllabograms KI + O occurs on scores of tablets from Knossos alone. These two supersyllabograms always precede the ideogram they modify, and this ideogram is always either the one for “rams” (most often) or “ewes” and occasionally for “sheep” (the generic ideogram). When linked together in this fashion they always mean “a usufruct lease field which is a plot of land”, in other words “a usufruct leased plot of land” within the context of a larger “lease field” of which this plot of land is one among several. How many we cannot say, because we were not there when the Minoan/Mycenaean overlords parcelled out their fields to be leased as smaller plots of land to their tenants. The number of leased plots per lease field may have been as few as 4 or as many as 10 or 20. If the number were to have run to the latter end of the spectrum, that would have meant that the lease fields themselves, which were to have been sub-parcelled into leased plots must have been quite large, even if the size of the separate leased plots might have been as small as approx. 1 hectare. In that scenario, a lease field with 20 leased plots of approx. 1 hectare would be about 20 hectares in size. It is to be clearly understood that we have no yardstick or should I say metric stick by which to determine exactly or even approximately the Minoans at Knossos or Phaistos or the Mycenaeans at Mycenae, Pylos and elsewhere actually measured the size of their fields. The hectare is just an approximation, nothing more. But it will do as well as any measure. On another count, we note that on this tablet, the land tenant is Siadyweis. He is not the land owner because he is clearly leasing a plot of land on a much larger lease field owned by the overseer. Also, we note that the person connected with the Minoan Goddess, Potnia, must be her priest, because it is in the masculine. This seems a rather odd arrangement to me, since in almost all other instances where this famous Minoan goddess is mentioned, it is with reference to her Priestess(es) and not her Priest(s). The Minoan religion was substantively matriarchal, not patriarchal. That said, this tablet clearly defines her attendant as her Priest. Linear B tablet Knossos KN 1084 E e 321 is the third and final tablet in our series on the supersyllabogram O = onato = “(usufruct) lease field”. By now the translation of the supersyllabogram O should be so transparent that you can practically read it with your eyes closed... well, not quite. You wouldn’t want to close your eyes (joke!). 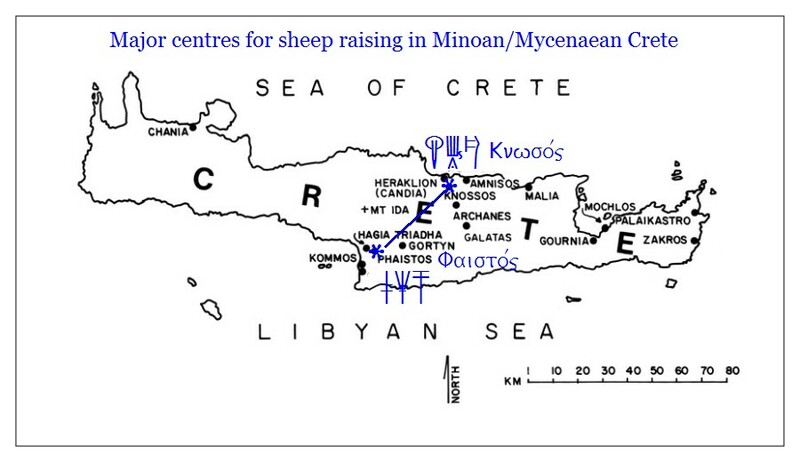 The cities of Phaistos and Pylos were the second and third largest sheep raising locales in Minoan-Mycenaean Crete and Mycenae after the huge metropolis of Knossos (population ca. 55,000, an enormous city for antiquity). Whether or not Phaistos or Pylos came second or third or vice versa is anyone’s guess. So let’s move on to the next supersyllabogram KI for sheep raising and sheep husbandry. Can you guess what it means? Hint, it also has to do with land tenure. Linear B tablet KN 777a K b 01 deals with the wheat and barley harvest at Knossos, without specifying the amount of the barley harvest, and then goes on to enumerate the wheat harvests alone at Amnisos and Phaistos. We note that the toponyms go by their ethnic names. So I have deemed it appropriate to translate their names as “by the farmers of”... + locale. I find it very suspicious that the scribe has chosen to allot 100 + hectares to every single locale. Bizarre. Maybe he was high on something. But of course, I doubt that. The only alternative explanation that I can think of is that the palace administration at Knossos capped the wheat harvest at each of these milieux. Otherwise, the total amount of wheat produced would have filled the granaries (presumably at Knossos) to the bursting point. I recently discovered this lovely image on the internet, and I just have to share it with you. PS, regardless of what anyone claims, the Phaistos disk has not been deciphered to anyone else’s satisfaction. It is notable that, unlike the previous tablets we have just posted, all of which contain the ideogram and the supersyllabogram DA for DAPU = labrys, this tablet has only the ideogram. It may have the ideogram and the supersyllabogram DA on the second line, but we can never know as it is right-truncated. This tablet can be readily translated, as illustrated above, but only if the scribe made two spelling mistakes, and the chances of that are extremely remote. However, I have ventured this translation, as it just might be the “`correct” one. You never know. This is the last of the Knossos tablets directly dealing with the DAPU, labrys or the double-axe in the hierarchy of the Minoan/Mycenaean religion in the military sector. This is all the more plausible as few other centres for sheep raising are mentioned with any frequency on the Linear B tablets from Knossos. It is readily apparent from this appendix that we are dealing with modern ideograms, all of which are international standards, and which are recognized as such world-wide. 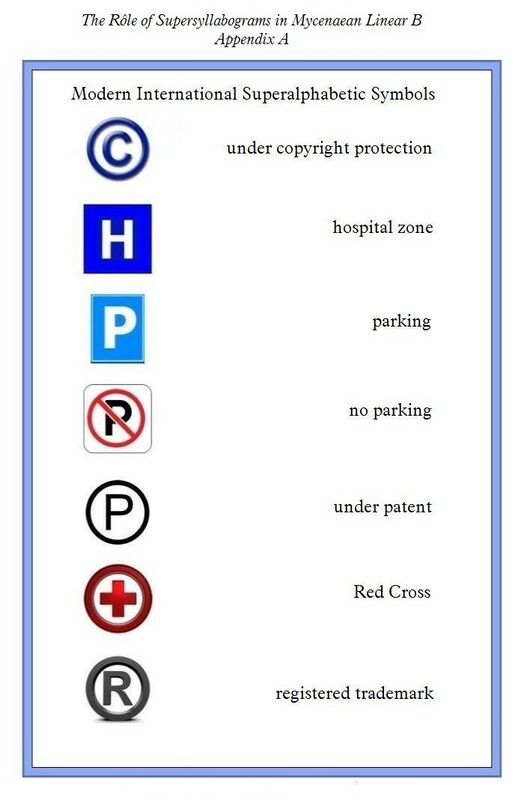 For instance, everyone in the world knows that the first symbol or ideogram means “under copyright protection”, while the fourth means “no parking”. 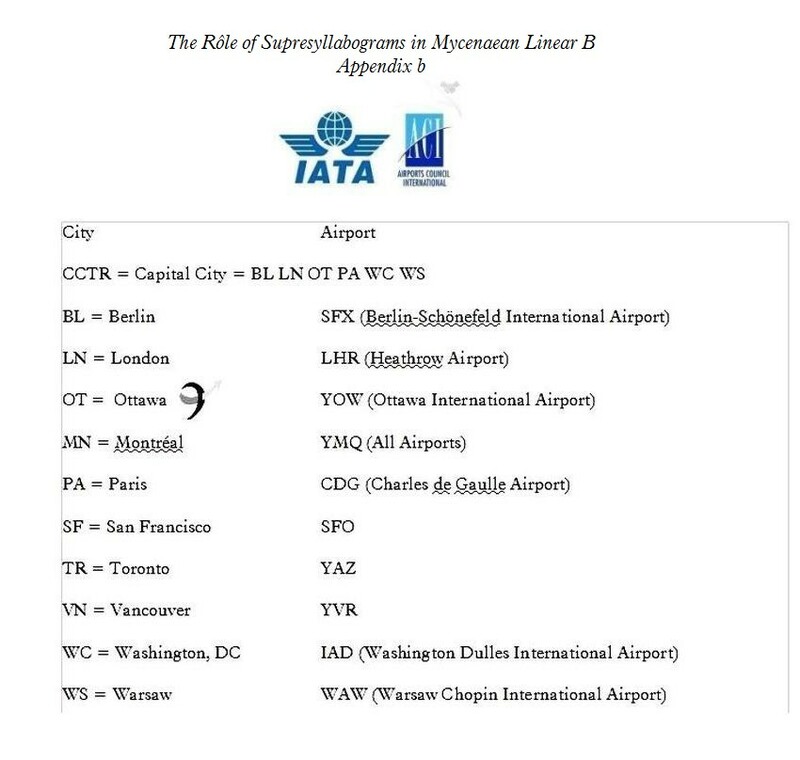 Clearly, the abbreviations for modern city codes, even though they consist of the first two letters only of the 10 city names are identical in structure and format to the ancient city names, represented by the first syllabogram, in other words, the first syllable in each, which we find in Appendix C.  This astonishing co-incidence reveals something of the sophistication of Mycenaean Linear B taken to its limits. It was in fact Prof. Thomas G. Palaima who first identified these city names (Knossos, Zakros, Pylos etc.) 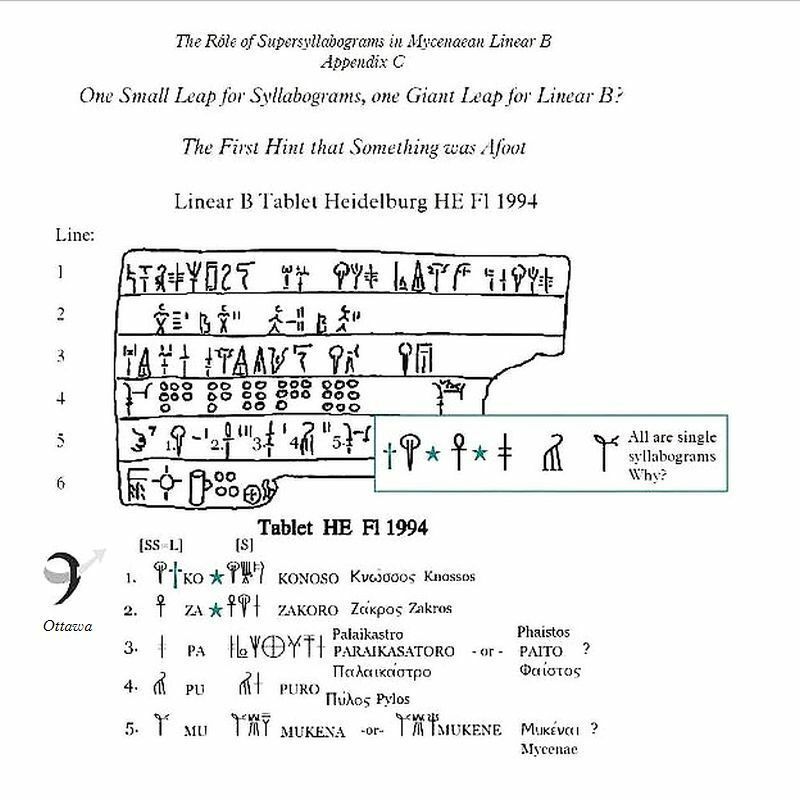 in his superb translation of Linear B tablet Heidelburg HE Fl 1994. What he failed to realize was that he had in fact discovered the sypersyllabogram, which I finally came to realize in 2014 was always the first syllabogram, in other words, the first syllable only of a particular Mycenaean Greek word, in this instance, a city or settlement name. In retrospect, we cannot blame him for this apparent oversight, because that is all it was, apparent. He never got around to a meticulous examination of the 3,000 relatively intact tablets from Knossos, which I took upon myself to carry through to its ultimate revelation(s). And what a revelation they proved to be, when in the course of over a year (2014-2015), I discovered to my utter astonishment that some 700 (23.3%!) of the 3,000 tablets I examined all had at least one supersyllabogram on them, and some as many as four! Some of the tablets I examined had supersyllabograms only on them, and no text whatsoever. The question was, I had to wonder – and I mean I really had to wonder – what did they all mean? The answer was not long in coming. Within 2 weeks of identifying the first new supersyllabogram, I had already isolated & defined more than 10 of them! When I speak of supersyllabograms, I do not mean simply city or settlement names. Far from it. These are just the tip of the iceberg, and they are atypical. There are at least 30 supersyllabograms in all, out of a syllabary comprised of only 61 syllabograms, in other words 50% of them. That is a staggering sum. Supersyllabograms range in meaning from “lease field” to “plot of land” to “sheep pen” to “this year” (among the first 10 I discovered) referring to sheep husbandry in the agricultural sector, from “cloth” to “well-prepared cloth” to “gold cloth” and “purple dyed cloth” in the textiles sector, and on and on. That this is a major discovery in the further decipherment of Mycenaean Linear B goes practically without saying. 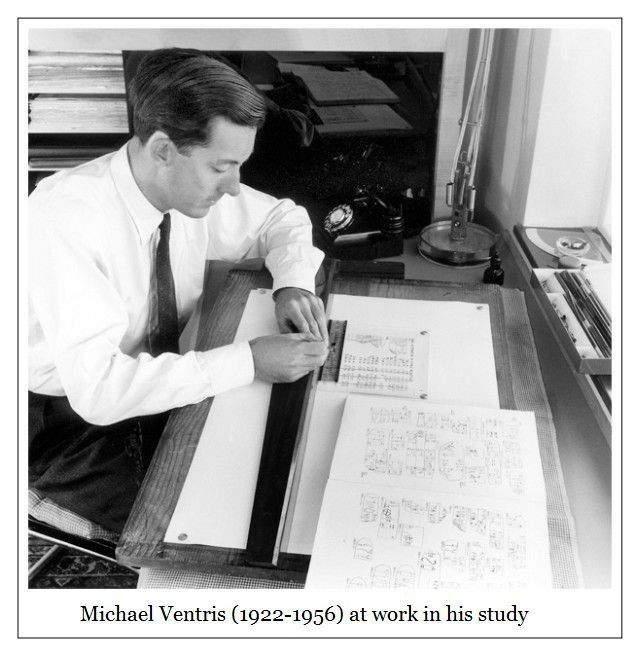 In fact, nothing like it has been achieved in the past 63 years since the decipherment of the vast majority of Mycenaean Linear B by the genius, Michael Ventris, in 1952-1953. More Appendices to follow in the next post.